Global shares were higher in Asia-Pacific trade Tuesday, lifted in part by a stronger U.S. dollar, though markets in Australia bucked the trend due to declines in utility and mining stocks. Industrial and precious metals prices were down, pressuring shares of Australian-listed heavyweights like BHP Billiton BHP, -0.02% , which was last down 0.8%, while Rio Tinto RIO, +0.02% was off 0.7%. Spot gold prices were recently down 0.2%, extending losses after Monday’s flash crash, which was caused by suspected human error. It plunged 1% shortly after the opening call in London on Monday and traded about 1.8 million troy ounces in a minute, “which is more than the volumes traded seen during recent global risk events,” noted ANZ Research. Australia’s benchmark S&P/ASX 200 XJO, -0.21% was down 0.3%, with the utilities subindex falling 1.7% to an almost two-week low, while the materials subindex was off 0.7%. Elsewhere, the Nikkei Stock Average NIK, +0.36% was up 0.4% to a one-week high, while Hong Kong’s Hang Seng Index HSI, +0.08% was up 0.2%. Korea’s Kospi SEU, +0.19% edged up 0.1%. Singapore’s Straits Times Index STI, +0.40% was last up 0.4%, with markets there reopening after a three-day weekend. An overnight slump in the U.S. technology sector saw similar stocks in Asia region turn lower in early trade. Taiwan’s Technology index slid 0.8% versus a 0.1% decline in the benchmark Taiex Y9999, -0.03% . Samsung Electronics 005930, -0.04% dipped 0.2% in Seoul. “Asia Pacific shares, which saw broad gains at the start of the week, could find more disparate returns on the heels of a tech slide,” said Jingyi Pan, a market strategist at IG Group. In Japan, a softer yen gave exporter stocks a lift by making it cheaper for them to ship their goods around the globe. 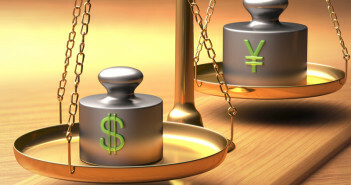 The dollar JPYUSD, -0.020555% nearly reached ¥112, hitting its highest levels in a month. Among individual stocks, Hitachi 6501, +2.21% rose 2.3% while Murata Manufacturing 6981, +1.96% added 1.6%. However, trading in troubled air bag maker Takata’s 7312, +45.45% shares remained ask-only following its bankruptcy filing, meaning that no shares have been traded because sell orders have overwhelmed buy orders. The air-bag maker, which will be delisted July 27, filed for bankruptcy protection after failing to agree with auto makers and other creditors on how to split ballooning recall expenses for its defective air bags. Shares plunged 67% last week as reports of a looming bankruptcy filing crushed the stock. Also, Toshiba 6502, -2.08% was off 2% as expectations grew that it could formally agree to sell its memory chip business in the near term. More broadly, investors will be closely watching comments later in the day by U.S. Federal Reserve Chairwoman Janet Yellen. The U.S. dollar was getting some support early Tuesday due to hopes that Yellen will repeat the hawkishness she presented in a news conference earlier this month, according to Kathy Lien, head of forex strategy at BK Asset Management. “What matters most this week is Fedspeak,” said Lien, adding that a hawkish Yellen could to send the dollar to ¥112.20 at the least. Investors are concerned about whether Yellen believes recent softness in U.S. data is transitory, as they look for more guidance on the pace of rate increases.